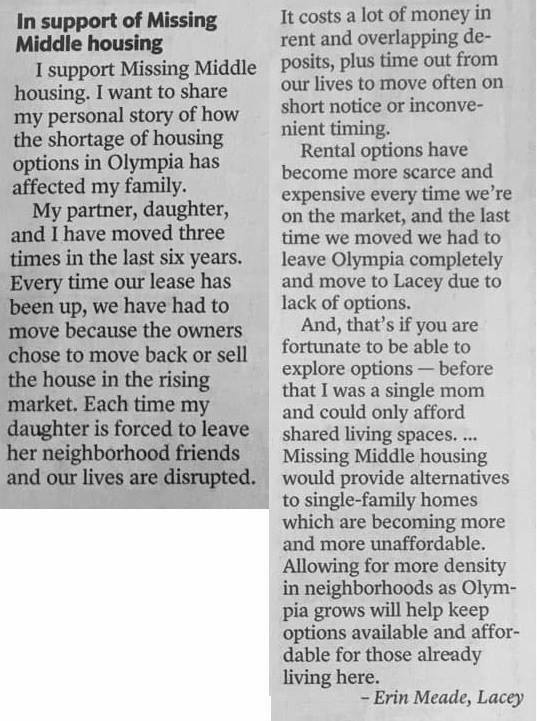 The Missing Middle housing recommendations are proposed changes to building codes in Olympia neighborhoods that, if passed, will allow for more diverse housing options. This proposal removes barriers to building accessory dwelling units (ADUs), tiny homes, duplexes, triplexes, fourplexes, courtyard apartments, cottage homes, townhouses, and single room occupancy residences (SROs). The changes do not impose higher density limits. 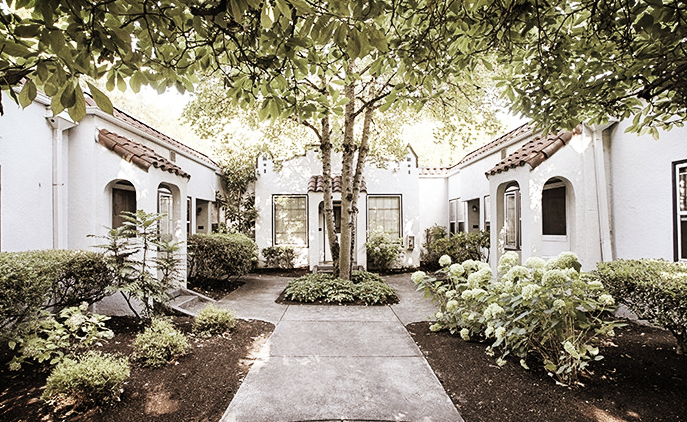 They help us to achieve current density limits by allowing diverse housing options that are compatible with the existing scale and character of neighborhoods. The city is talking about the Missing Middle as a component of the Comprehensive Plan to address population growth, housing affordability, access to public transportation. It is also among our strategies to prevent sprawl into rural areas. When facing these issues, it is important acknowledge that the Missing Middle is a piece of a larger puzzle, and does not go far enough to address the need. These recommendations are expected to create only 474 to 946 new residential units (not including ADUs) in all of Olympia over the next 20 years. That only represents 3.6% to 7.3% of the need for new residences through 2035. Nevertheless, it is a step in the right direction. Some people are concerned about how neighborhoods will change. Our neighborhoods are already changing: they will either become more exclusive and expensive, or more diverse and inclusive. Others are concerned that new housing will not be affordable. This proposal is not intended to provide affordable housing (though it will provide more opportunities to do so). The intent of the Missing Middle is to address issues of affordability that are tied to insufficient housing for those of average median income. If more people of average median income are able to afford housing, fewer people will be at risk of becoming cost-burdened or homeless. There has also been concern on the environmental impact. Missing Middle housing is an environmental solution to population growth by allowing housing in areas that are already developed, rather than pushing growth into rural habitat and farmland. The Hearings Examiner has determined that this process and proposal are aligned with the State Environmental Policy Act (SEPA). There is broad, vocal support for the Missing Middle. Please see below for support from community members, as well as local and statewide organizations with diverse missions. Olympians For People-Oriented Places - signed by a long list of supporters whose interests include affordable housing, building, the environment, transit, planning, commerce, climate change, social justice, and farm and forest preservation.